Want to commission an art project? 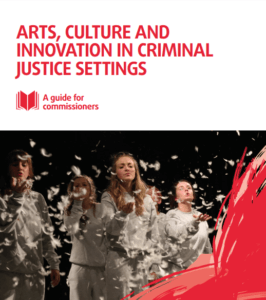 Written by Andy Parkinson from Consilium Research and Consultancy on behalf of the National Criminal Justice Arts Alliance, this guide provides those with responsibility for supporting the education, health, wellbeing and reintegration to society of individuals within the Criminal Justice System with clear information on the valuable role arts can play in supporting these objectives. The guide provides practical information and ideas for those wishing to commission artists and arts organisations and includes details of how to identify providers and case studies demonstrating how arts activities can be used to meet the needs of offenders. Four months in, how are arts organisations finding the new prison education commissioning tool?